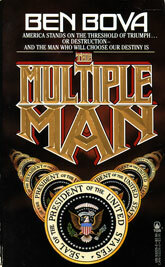 Just finished reading The Multiple Man. Bova is one of the greats in science fiction, and he measures up to his own name in this thriller. It’s hard to believe the novel was written back in 1976; it feels incredibly contemporary. The plot revolves around the President of the United State’s press secretary, who, with the help of the Secret Service, discovers a dead body behind a building where the president is giving a speech. What’s odd, however, is that the corpse looks exactly like the president–meaning someone has made a double. And if someone can make a double, does that mean they’ve already succeeded in getting one into the White House? Is the acting president, the REAL president? This is classic Bova: wonderful characters intertwined in believable relationships, digging their way through incredible difficulties. The science-fiction element is always in the background, never crowding the story. It’s a fast read. If you can find a copy, I highly recommend it.